Training, Zwift & new shoes! It’s been a long winter this year in the northeast and I’ve been making the most of it with my Trainer Road workouts. As I write this post I’m in week 14 of using Trainer Road. The first 12 weeks were part of the “Sweet Spot” base phase and now I’m in the “General Build” phase. To say I’ve seen an improvement is an understatement. My FTP is up 15% from when I started back in November and I find it funny now that my tempo workouts are at/around that original FTP number. Finding Trainer Road has been a changer for me and I am always motivate to get on the bike and do my next workout. Now to compliment my Trainer Road workouts I also have Zwift! I was accepted into the beta program a week ago as a Mac tester (there have been Windows testers since Oct/Nov of last year). I don’t think I can do the Zwift experience any justice here, but it is a lot of fun and even if you just want to take an easy ride around the island you inevitably will find yourself going for one of the jerseys, closing the gap or just dropping other wheel suckers! I believe they call this the Zwift Effect. The best part is that I can use Trainer Road along with Zwift. I just do my normal TR workout while tooling around the island – trying hard to ignore the “competitions” and focusing on the workout but it does provide some relief and distraction from just watching numbers on the screen. Plus I have a good playlist that keeps me motivated as well. Here is a screen shot from one of my first rides on the island. There was a bug this session and it seemed I was all alone on the island so it wasn’t hard for me to capture the orange jersey! Zwift has become so popular that people are scheduling group and century rides. Also keep your eyes peeled while you are on the island because you may see the likes of Jens Voigt, Laurens Ten Dam and several other pros riding the island! I can seriously see myself Zwifting during the warmer months if the weather turns foul or for an after work ride if I don’t beat the sunset. Last but not least, I got me some new cycling kicks! I’ve been on the hunt to replace my current shoes for a while, not that there is anything wrong with them but I was looking for something more “road” oriented and a bit lighter. I was currently wearing a pair of Pearl Izumi X-Alps that I had from my mountain bike riding days and I stayed with SPD pedals on my CX bike so I just continued to use them. I do like the 2 bolt SPD system, it makes it easy when all bikes use the same type of pedals, so I wanted to stay with that system but with a less aggressive sole than most 2 bolt MTB shoes have. 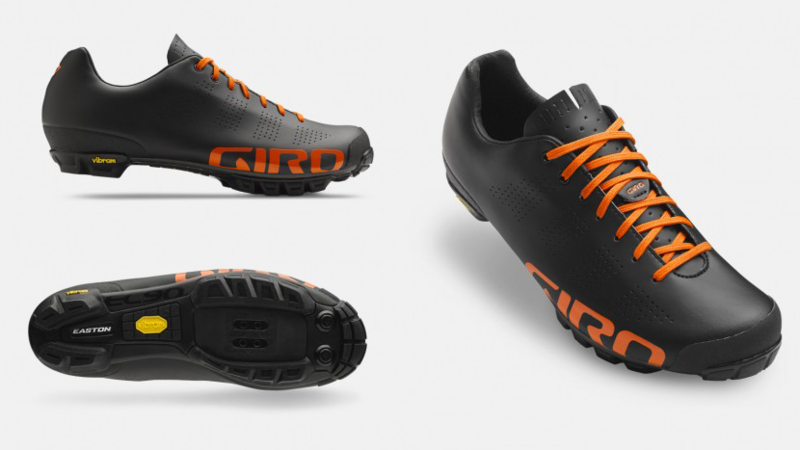 After a long search and a lot of research I decided on the Giro Empire VR90 shoes. The styling of these shoes drew me in and I couldn’t get away. This shoe is essentially the same as the Empire road (3 bolt) shoes with a Vibram rubber lugged sole attached. The original Empires were developed by Giro for Taylor Phinney and has essentially become their flagship model with several other pros now wearing them. I was a little skeptical of the laces, but after a lot of research I put those fears to rest. They shoes just form to your foot, the laces don’t loosen up and once tied I have never felt the need to stop and readjust. They actually seem to get more comfortable each time I wear them. Weight for a size 42 is 315g, which makes them pretty light among cycling shoes. Along with the shoes comes a nice carry bag, 4 spikes with a wrench and 2 pairs of different sized arch supports (a third is in the shoes) so you can totally customize their fit. I’m enjoying these shoes so much I only wish I could wear them off the bike as well! Well done with the FTP gains! Are you planning on doing a Specialty plan after Build? I’ve had my eye on these shoes for a while, they looks awesome! Are the laces different at all than on a normal pair of running shoes or are they pretty standard? Thanks Trevor. Trainer Road has really helped my fitness in the off season and I’m always looking forward to my next workout. I’m planning on doing one of the Century Speciality plans after my build phase. By that time hopefully Spring will be here and I’ll be regularly riding outdoors, so I’m thinking I’ll mix in the plans training sessions in between my outdoor rides.